Thursday morning, former Michigan QB Rick Leach called into WTKA's morning talk show "Michigan Insider" (audio link) to discuss a little something that's been on his mind. He had nothing but praise for Rodriguez and the current direction of the football squad. 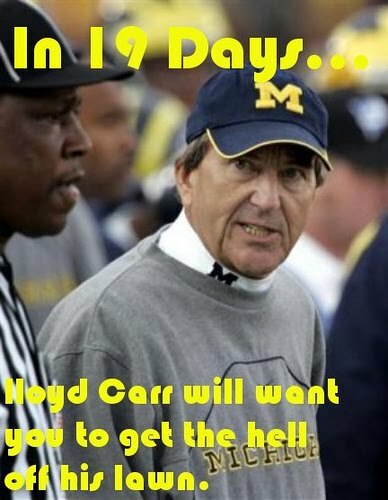 But he decided to went a little frustration towards former Michigan head ball coach Lloyd Carr and some other issues on his mind. Long story short, Carr was in attendance at Iowa last weekend, and was spotted in the press box being entertained by various Iowa athletic dept. staff in a university suite. “I saw an article that said Lloyd Carr was at the game in Iowa. No. 1, whose ticket did he go on? Whose private box was he sitting in, and whose university staff was in the box with him? A little harsh? Maybe. I can see how this may rub some former ballers the wrong way. 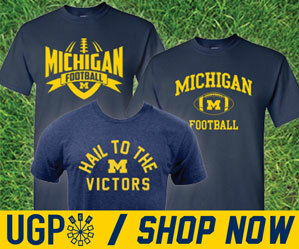 But I can also see how this could be just a simple act of Big Ten diplomacy by the fairly straight-forward Lloyd Carr. I mean, when I think of Lloyd, backstabber is not really the idea that comes to mind. He is an assistant athletic director. I would not be surprised nor upset to know Lloyd has a few friends at Iowa with whom he would like to share some time with. I mean, hey....Lloyd's a likable guy! However, missing from the Freep article, not surprisingly, is the other part of Leach's comments on WTKA about a possible leak inside the Michigan athletic department. There has been some bad press about Rodriguez this year, going back to practice-gate in late August, and now with the news about Michigan's football team having a highest ever overall GPA for a Michigan team, as reported by Rodriguez...and then quickly retracted after heat came from the Detroit Free Press about the voracity of the coaches claims. Leach thinks there's someone inside the department that may be feeding the press insider info...and possibly doing so with ill-intent. This is not the first I have heard of this issue. But, like before, I have nothing definitive to support any claims, so I will keep this to myself until more substantial evidence comes to light. But having a Michigan QB legend call into a radio show with a rather large chip on his shoulder lends some credibility to this issue. This is probably not the last time we'll discuss this topic here.